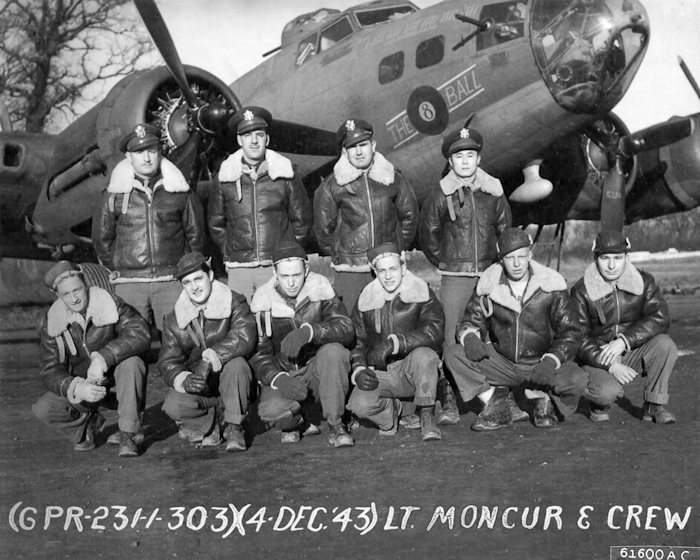 The 359th BS Vern L. Moncur Crew was the first and only crew assigned to the famous B-17G Thunderbird #42-38050 (BN-U). 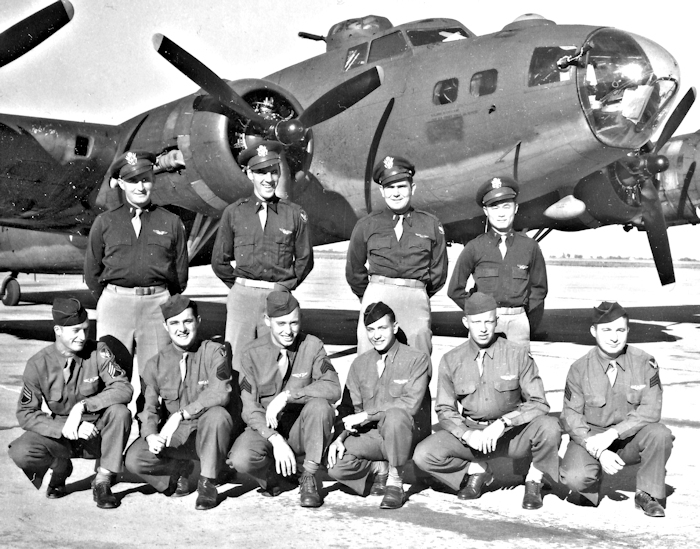 They flew their 28 combat missions between 13 December 1943 and 10 April 1944. 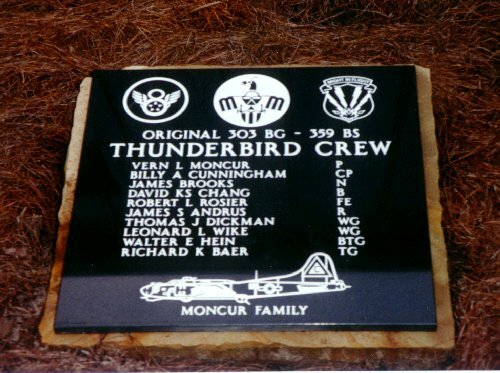 Much more information on the Crew and Thunderbird is on the Thunderbird Memorial Page. Mission #94 - 31 Dec 1943 - Completed trip but bombs brought back to Molesworth. Overcast conditions (10/10th clouds) made it impossible to bomb visually. 1Lt Vern L. Moncur (P) - 28 credited mission flown - All Missions flown as First Pilot. Completed combat tour on 10 April 1944 (Mission 133). 2Lt Billy A. Cunningham (CP) - 27 credited missions flown: 24 with 1Lt Moncur (All Moncur missions except 130, 131, 132 and 133); 3 with other Pilots - 2Lt Elmer W. Young (113), 1Lt Howard D. Dahleen (119 and 121). Completed combat tour on 27 March 1944 (Mission 129). 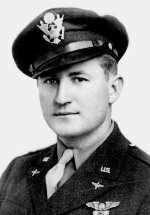 2Lt James Brooks (N) - 29 credited missions flown: 27 with 1Lt Moncur (All Moncur missions except 133); 2 with other Pilots - 1Lt Arthur J. Hybert (112), 2Lt Edwin H. Assenheimer (127). Completed combat tour on 9 April 1944 (Mission 132). 2Lt David K.S. 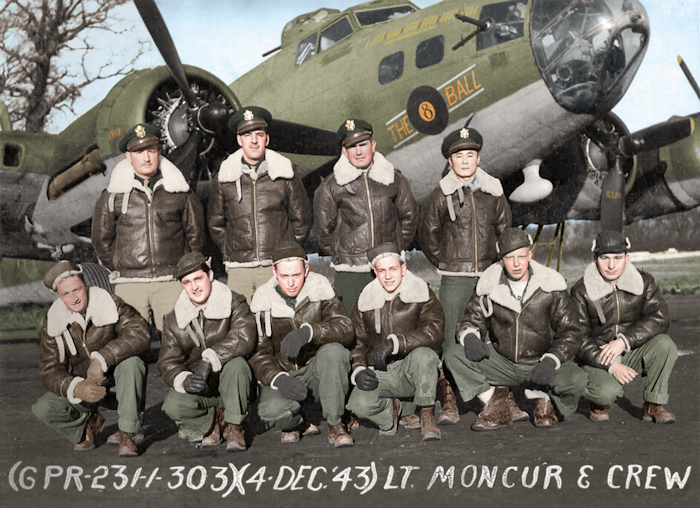 Chang (B), T/Sgt Robert L. Rosier (E), T/Sgt James S. Andrus (R), S/Sgt Thomas J. Dickman (WG) S/Sgt Richard K. Baer (TG) - 28 credited missions flown - All with 1Lt Moncur. No missions flown with other Pilots. Completed combat tours on 10 April 1944 (Mission 133). S/Sgt Walter E. Hein (BTG) - 28 credited missions flown: 27 with 1Lt Moncur (All Moncur missions except 133); 1 with 2Lt Kenneth C. Edwards (113). Completed combat tour on 9 April 1944 (Mission 132). S/Sgt Leonard L. Wike (WG) - 29 credited missions flown: 26 with 1Lt Moncur (All Moncur missions except 101 and 103); 3 with other Pilots - 1Lt Kenneth C. Edwards as Right Waist Gunner (136 and 137), 2Lt Maurice G. Daum as Top Turret Gunner (138). S/Sgt Wike was the assigned Moncur Crew Tail Gunner, but traded positions with S/Sgt Baer on all Moncur missions except the first (88). He is shown as Tail Gunner on all loading lists. Completed combat tour on 20 April 1944 (Mission 138). 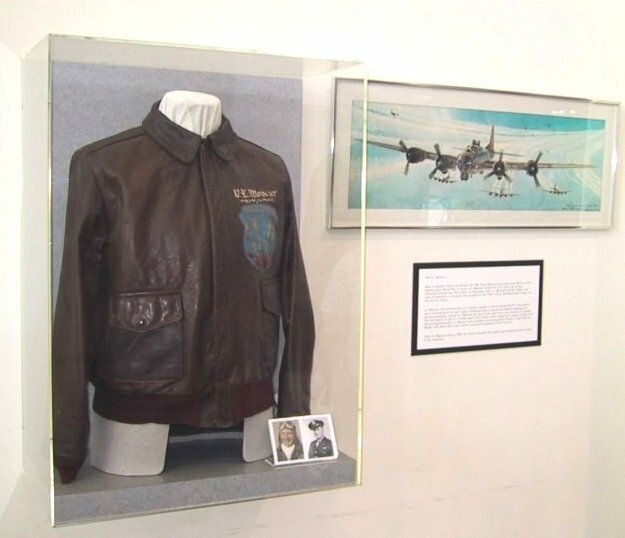 Memorial to Vern Moncur at the Hill Air Force Base Aerospace Museum, Ogden , Utah.